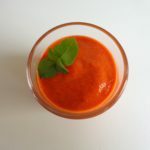 This flavor-packed variation on gazpacho, made with roasted red peppers, is easy to prepare and makes an elegant starter on warm summer evenings. It can be made in advance and refrigerated until shortly before serving. As the soup is rich and pungent, the servings should be small. Think palate teaser rather than bowl of soup. For festive occasions, add a small savory biscuit, some finely chopped black olives and a tiny sprig of basil (see note below). For everyday dining, just the basil on top will suffice. And for a vegan version, simply omit the cream. Rinse the peppers and set them on a pie plate or baking dish. Using a sharp knife, pierce each pepper in a couple of places to let the steam escape as they roast. Be sure that the incisions are facing upwards to ensure that the juice remains inside the peppers. Roast for about 45 minutes, until the skin of the peppers is starting to char and they have collapsed a bit. Remove from the oven and allow to cool. Slice a circle around the top of each pepper and pull out the stem and seeds. Slice the peppers in half, catching the juices in your baking pan. Transfer the halves to a clean plate. Remove and discard the membranes and any pesky remaining seeds. Pull the skin away from the pepper halves, leaving only the flesh. Transfer to another plate. Carefully check each piece of pepper to make sure no skin or seeds remain. Cut into slices and place in a blender. Now strain the pepper juices you collected through a sieve into a small bowl. Transfer to the blender. Add the olive oil, vinegar and salt. Blend until very smooth. Pour the soup into a clean container. It will be rather thick at this point. Stir in the cream if you are using it (for a vegan version, shown at right, omit the cream). If the soup still seems thick, add a little water. Taste and adjust the seasonings as necessary. Chill until nearly ready to serve. For beautiful presentation, serve the soup in small cups or glasses. Add a basil leaf or a more elaborate garnish (see note). Serves 4. 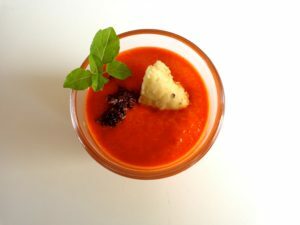 Note on the garnish: I was inspired to make red pepper soup after tasting it at the Paris restaurant Zebulon, where it was served as a palate teaser in a very small bowl, garnished with an oregano-flavored savory biscuit, a tiny smattering of finely chopped black olives and a tiny sprig of herbs. For my version of the biscuit recipe, click here. For the black olive bits, remove the seeds from a few black olives and chop them in a blender. Or, for an easier method, use a tiny teaspoon of tapenade, either homemade or store-bought. The basil, which adds an attractive green touch of green, may be substituted with fresh cilantro.